Reminder: The Ahuroa Hall Pot luck Dinner and Fireworks night is Saturday 3rd November! Everyone is invited, so come along and meet some new people or catch up with friends. This was really successful the last time we ran it. Next weekend – Saturday 3rd November we are holding a Community Pot Luck dinner and Fireworks Night at the Ahuroa Hall. Only 2 sleeps to go until our Fair, Feast and Fireworks. Our silent auction items are amazing. Check out our flyer for some ideas to spend your dollars on. Also remember – this year we have a waterslide, so togs are a must for kids. Many thanks in anticipation for your patience with our fireworks display on Saturday, 18th March. We are aware that fireworks do cause distress to some animals, and assure you that we will minimise this as far as possible. We aim to finish our Fair around 8:30pm with the fireworks starting at 8:45pm. The display will last no longer than 10 minutes. It would be lovely to have you join us at our fair, we look forward to seeing you there. Once again, thank you for bearing with us. Saturday 18th March @ 4:30pm. 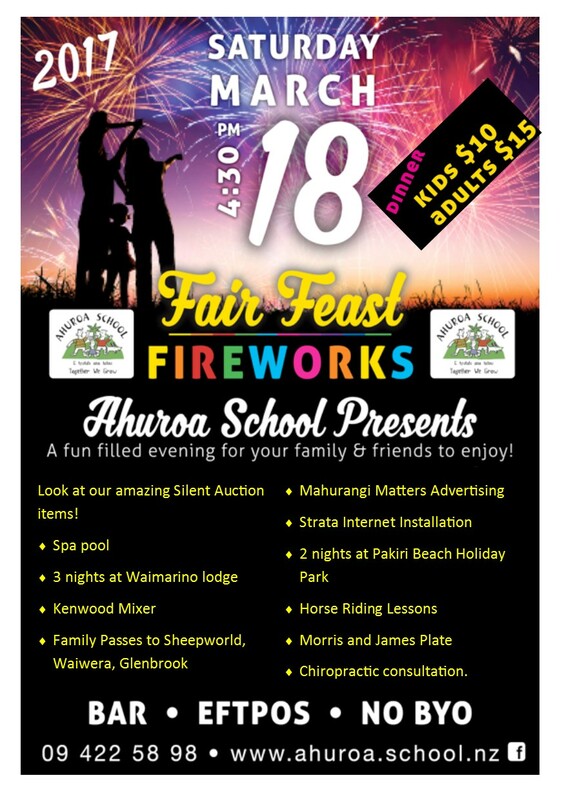 – It’s the Ahuroa School Fair, Feast and Fireworks!!! Save the date! – Contact the school on 09-4225898 for more information.